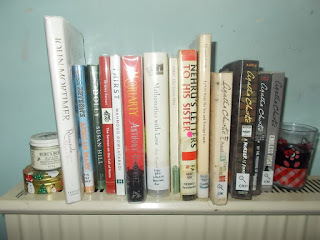 Briefer than Literal Statement: fourteen reasons I'm going get a library fine again..
fourteen reasons I'm going get a library fine again..
John Mortimer's Rumpole and the Reign of Terror, which I got from Mitcham library after reading Rumpole at Christmas. I meant to wait for colder weather before reading any more Rumpole - it's an winter sort of pleasure - but I've just rediscovered him and I'm impatient. To be enjoyed with a glass of Chateau Thames Embankment (in this case Montepulciano) in my Hello Kitty glass to the right there. That's my travelling glass, a useful size for fanta, wine or water for painting. Thick enough to be tough, and not likely to tip up. I brought it in Florence. 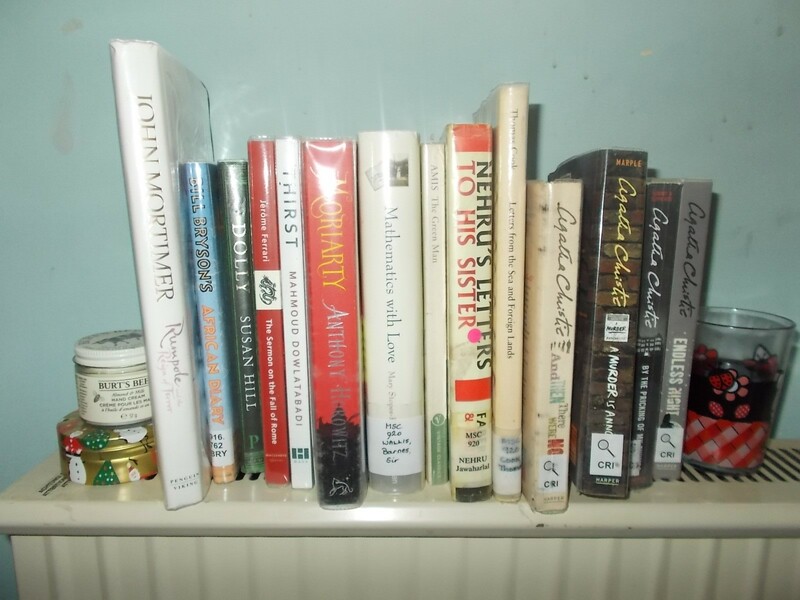 Bill Bryson's African Diary - another not yet read, this time from Wimbledon Library, and next to it Dolly by Susan Hill. I like Hill very much and she delivers reliable chills, but I don't think she's got whatever it is that makes a book a classic. She's very much of the here, now, and sturdily middle class. The Sermon on the Fall of Rome, Jerome Ferrari (in translation) another I've not read yet but the reviews promise amazing things, and I wanted to read more work in translation. Thirst by Mahmoud Dowlatabadi, again in translation. I normally avoid fiction about war, especially recent conflicts, but I think this appealed because it promises to show both sides, not just one. I also avoid books about writers trying to write, but here I'm hoping it will leaven the bleakness of conflict. I got this from Mitcham library, which has a homely between-war facade and core with a square 1970s build wrapped around three sides of it, like one of those neck cushions people are meant to use on aeroplanes. Moriarty by Anthony Horowitz. I read Horowitz' The House of Silk some years ago, and although I felt the sensibilities of Holmes and Watson were slightly anachronistic it was a good yarn. I've only recently started to appreciate how many 'new' Sherlock Holmes spin-off stories there have been. From Julien Symons' Sherlock obsessed actor in the 70s, to the recent TV series, to The Seven Percent Solution (a retelling in which Sherlock begins to succumb to the cocaine and have delusions about Moriarty) to the film Young Sherlock Holmes. Neil Gaiman has written Holmes and Watson into an alternate universe, and Disney has made him a cartoon mouse. With all that going on it's impossible to be precious about the canon. And it may be good. Mathematics with Love - the Courtship Correspondence of Barnes Wallis. This is a very odd book, and a very odd correspondence. Wallis is in love with a young student at London University, and offers to help her with her studies. It's clear that if they weren't cousins he probably wouldn't be allowed to write to her at all, but as they are her father allows some flexibility. So they write the normal things you write in letters (or did, when people wrote letters), that a bee has landed on her pen because it is sticky with nougat, that he went to the theatre, and then she lays out the mathematical puzzles that bother her because her lecturer goes too fast, and he writes back with diagrams, and she responds with formulae, and I got very lost but didn't mind. What I did mind was the sentimental narrator who can't restrict herself to facts and says things like 'and the knight had won his lady' or 'a flood of emotion had been released in Barnes'. The book would be very much better if she kept quiet and let her readers judge for themselves. The Green Man - Kingsley Amis. A quite short book which I should have read by now. I had an Amis binge a year or so back, but have read nothing of his before or since. I always think Amis is writing with a male reader in mind, but the fact he's not writing for me doesn't make me not want to read him. His humour is darkly amusing. Nehru's Letters to His Sister. Kensington Library seems to have a lot of these books of letters - the above Barnes Wallis one came from them. This one was in a small display in the Central Library - they have these small frequently changed displays where things not normally on the shelves are trawled from archive and offered up, and there's almost always something interesting. The loose connection between the books this time seems to be sibling relationships. The next book, Cook's Tours, is a case in point. I should have returned this already since I've finished it, but I haven't yet. It's a series of letters (again) as published in the Times and temperance newspapers, sent back by Thomas Cook as he builds and promotes his fledgling company, making contacts in hotels and explaining the difference in British and American railways, and telling people what they can expect to see. He isn't as tolerant of other cultures as you might expect from someone so widely travelled - and particularly dismissive of anything which offends his Victorian morality - but he's certainly not backward for his time, and it's completely fascinating seeing how people travelled then, and the wonderful months-on-end-long tours that were offered to those who could afford them. The temperance side is also interesting, because it not only gives you an idea of how much people did drink, daily, but how they were expected to drink, even if they didn't want to. This still happens of course, but it's not socially acceptable in the way it clearly was. And Then There Were None. I've been rereading Agatha Christie for some time now and I'm getting into my less favourite ones. This is a very clever book - in many ways her cleverest book, but it's more thriller than proper puzzle. This was also, of course, the book with the offensive name and nursery rhyme, which is why they've changed the title. A very minor change, since the play was always called this. They've also changed the rhyme inside though and I'm less sure that's a good move. There is a point where in trying not to give offence you disguise past attitudes and pretend there never was a problem. And ultimately that serves the current crop of bigots who'd like to kid themselves that women's lib and race relations are just politically correct hysteria and there was never any real need for them. But having said that I was considering buying a copy of Kipling's Just So Stories at Christmas for my cousin's little boy, and I checked some of the language had been changed before I added it to the 'maybe' pile - so I can't claim to be consistent about this. A Murder is Announced - Agatha Christie. One of my favourites, and one I didn't even come close to solving the first time I read it. There are an awful lot of people pretending to be who they're not in this book, but that's kind of the point. That the war has shaken out all the odd certainties, and you have to believe what people tell you of themselves. Oddly the TV Marple I preferred for this one was Geraldine McEwan. It isn't usually, mostly because the changes that were made to a lot of the stories for that series didn't feel like they worked to me, but in this one she was engaged in a way Hickson simply wasn't, and it felt real. By the Pricking of My Thumbs - Agatha Christie. This is, or was, another favourite. The paperback my mother owned had a terrifying picture of a doll with a cracked head and a dead bird (actually all those old covers were frightening. The giant wasp and the diddy little aeroplane, the apple that is actually a skull, splashes of blood and staring eyes). Hopefully it's still a favourite, but rereading the earlier Tommy and Tuppence books (and the Bundle Brents and all) I found I didn't like them as much as I had when I was young. They're too silver screen and wisecracky. Incidentally, this was also one of the Geraldine McEwan Marples I couldn't stand. What was Marple even doing there? Why did Tuppence have to be completely rewritten as this flaky drunk whose children patronised her as a result? Endless Night - Agatha Christie. As I said earlier, I'm getting into my less favourite ones now, and this is definitely one of those. I remember feeling cheated when I read it. I was babysitting, so must have been in my teens, and I haven't read it again until now (or rather until a week ago). It's cleverly done, more cleverly that I could appreciate at the time I think, but it still leaves me cold. So that's the library haul. I'm lucky that I live and work in places with good libraries, I can't imagine what I'd have to spend on books if I didn't.